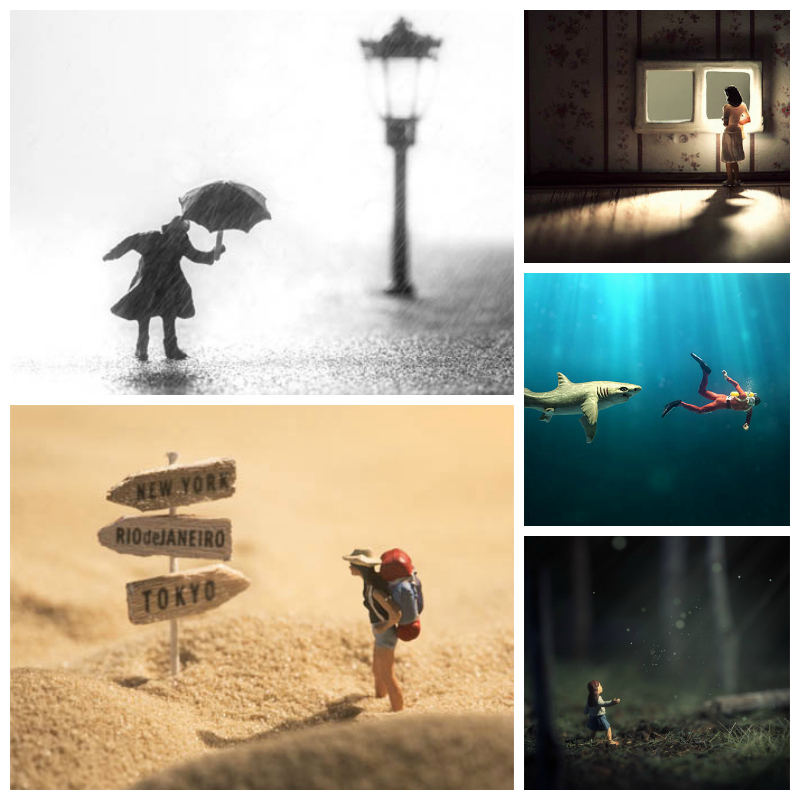 CW Photography is all about the passion for macro photography and diorama art. What do you get when inspiration meets the love for model building, all captured with a camera? Enchantingly quirky art prints that reflect life's small (and big) moments, of course. 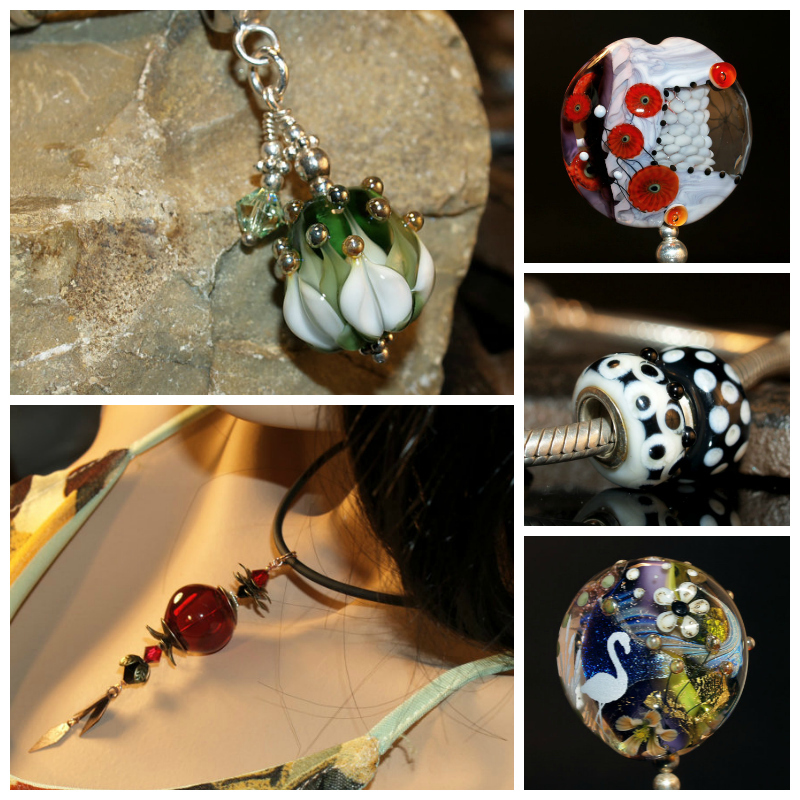 Cornelia Lentze specializes in designing and creating beautiful lampwork beads in her artist's studio. From the ever popular beads for charm bracelets straight to cute flower dangles, the love for intricate detail is evident in each piece of the collection. Charmingly charming indeed! What's it all about? This listing is for a surprise grab bag of my old stock. By old I mean made sometime last year and has already been re-listed once or twice. [...] Everything is in perfect condition, no faulty chains or clasps, and will come packaged as carefully and as lovely as all my other items I currently have listed. You will receive a minimum of 10 items [...]. Considering I rarely list anything for less than £4.99 you stand to make an absolute minimum of a £34.99 saving. I've got pin badges, charm key-rings, picture key-rings, glass key-rings, glass stud earrings, charm earrings, resin frame necklaces, charm necklaces, glass tile necklaces, rings, magnets, faux druzy jewellery, star-sign jewellery, brooches, hair pins, scrabble tile jewellery, bottle cap jewellery and more. Please note I have more necklaces than anything else so you may recieve more than one, though the design will differ. 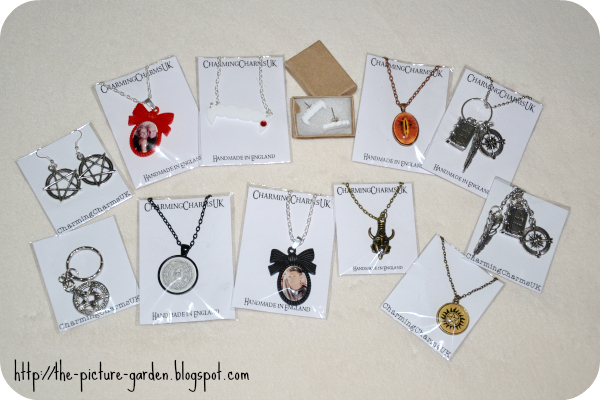 I've got jewellery inspired by Harry Potter, Sherlock (BBC), Buffy the Vampire Slayer, Lord of the Rings, Disney, Disney Princesses, Disney Villains, Creepy Disney Princesses, Game of Thrones, Halloween Jewellery, Supernatural, Dr.Who, Tru Blood, Avatar: the last Airbender, and the legend of Korra. If it matters to you please let me know in the 'notes to seller' section which 3 of the list above you'd prefer. Long listing text. Making choices. Let's cut right to the chase. I picked Buffy, Lord of the Rings, and Supernatural. I chose the latter randomly and in hindsight I should have gone for Sherlock instead, but never mind. The important thing is that I'm real pleased with my haul which included lots of keepers and a handful of pieces for gifting purposes too. To round things off, each item came individually wrapped which added to the Christmas morning feeling and there was even a list included, explaining what is what. Happy much? Super (naturally). Would you proudly wear jewelry inspired by books/movies or do you find them a bit cheesy? Which of the options available would have been your own choices? And don't the Vampire necklace and earrings make for a great Halloween getup? Dare to be different and pave the road with for concrete in your home. Frau Klarer specializes in items made out of quite an unexpected material for home decor and accessories. 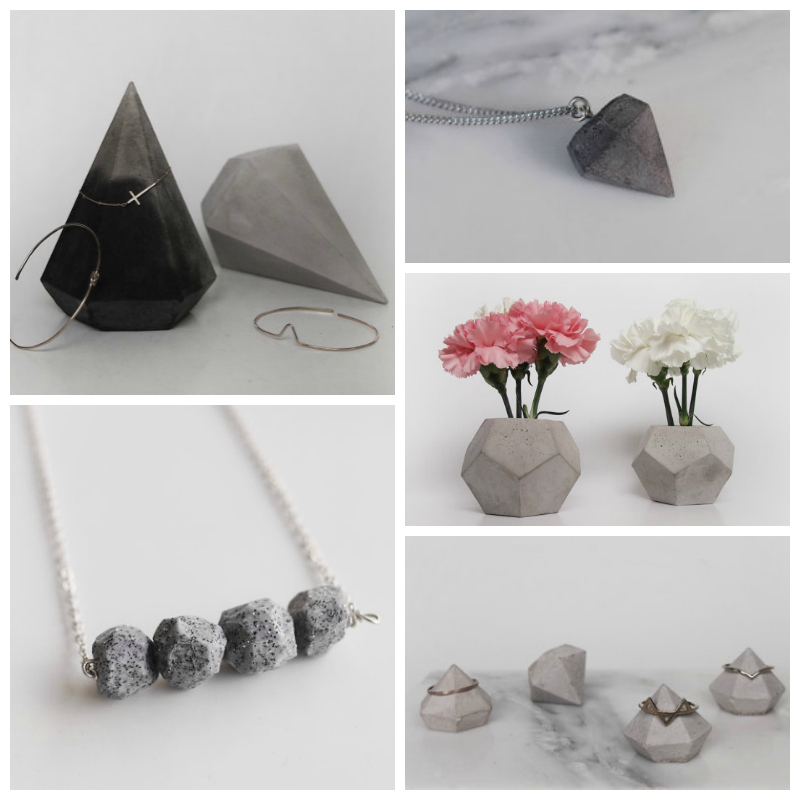 Raw and minimalist concrete diamond decor serves as paper weights or bracelet/ring holders while geometric marbled necklaces adorn your neck! Somewhere over the rainbow things might be a little mad. 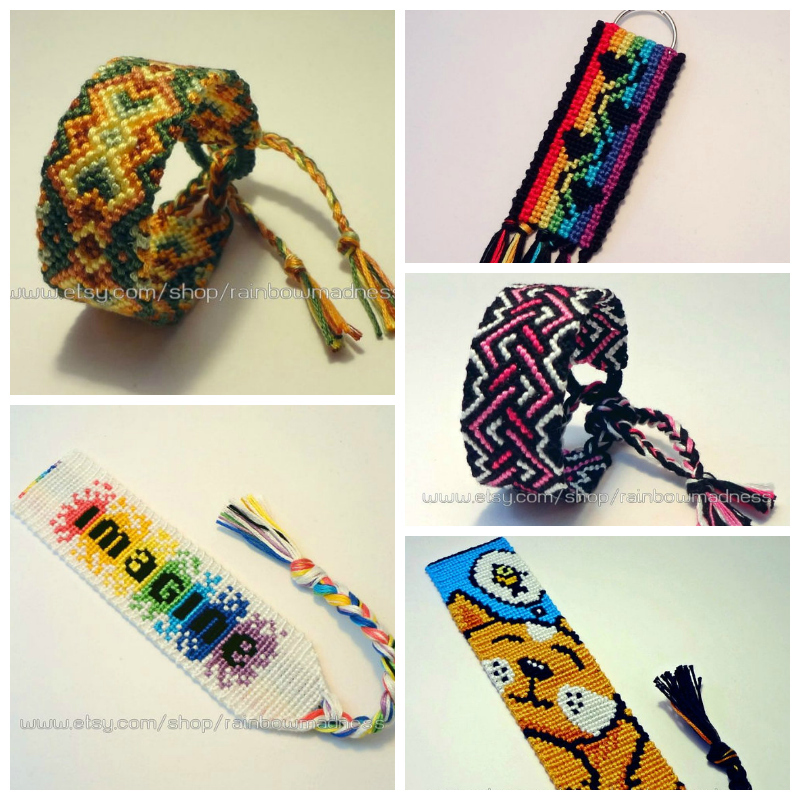 Foz's world of rainbow madness is where colorful yarns are knotted into snazzy bracelets, trendy bookmarks and the likes. You might not find a pot of gold at the end of this rainbow, but wearable rainbows are certainly the next best thing! Once upon a time aka four years ago I first signed up on Postcrossing and after taking a bit of a rather long break I've decided to finally reactivate my account. Now that I've decided to join the card-sending fun again, I figured why take baby steps when I can just the same go all the way aka I sent out the maximum of cards I'm currently able to send. Let me explain: When you first sign up you can have up to 5 postcards traveling at any single time. That number goes up the more cards you send. I am already up to 9 postcards as I already sent more than 35 cards. Once I've sent a total of 50 postcards I will be allowed to have up to 10 travelling at the same time. For more information check out the Guidelines and the FAQ. Last but not least, some general stats can be found here. 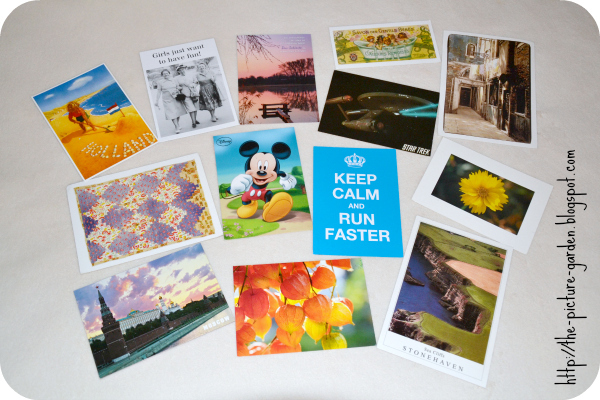 Were you familiar with Postcrossing? Maybe you are a member yourself or you're now playing with the idea of signing up? Let me know! Have you sent a card today? 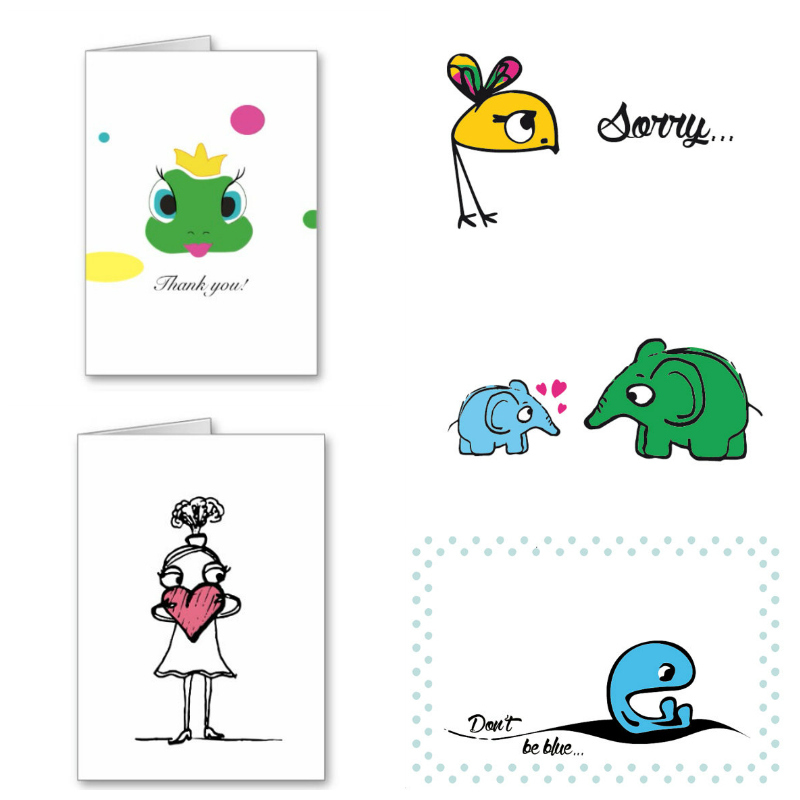 Frogitta offers colorful greeting cards, prints, invitations and other paper products for all occasions. These cute paper goods are all based on unique hand-drawn designs which will bring a smile on every face and make for lovely nursery decorations too! Wearing felt has never felt *wink* so good! 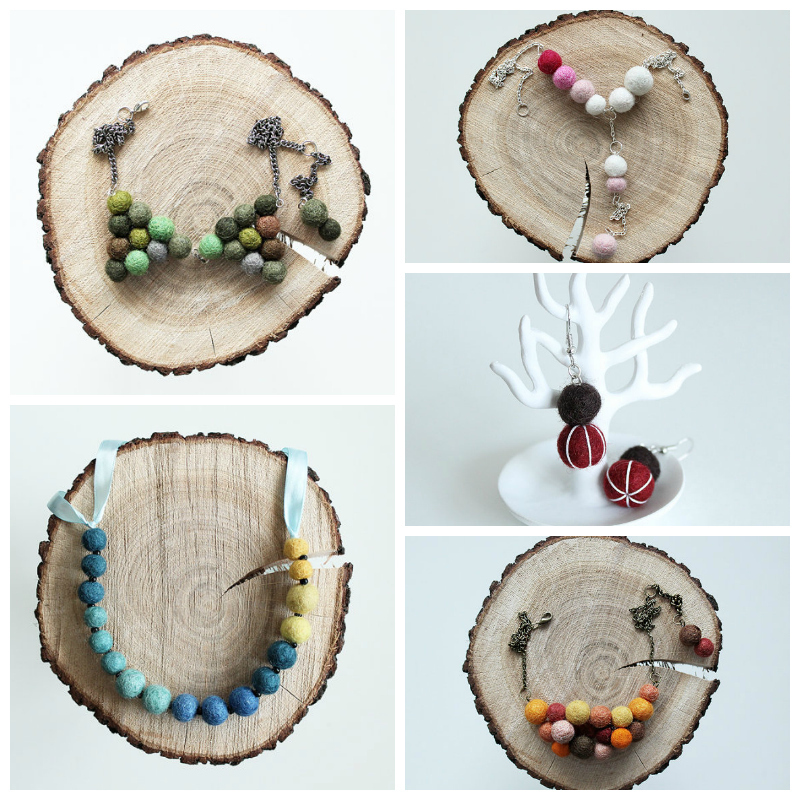 TraLaLand offers a lovely range of handmade felt jewelry! Colorful and playful these designs are wonderfully lightweight too and spruce up any outfit. Best of all, while you can only wear your wool sweater in winter, these pieces will cheer you up all year round! Any combination possible and any style, it's a mystery!! That's why it's a Lucky Dip and all for £5.00!! Each piece of jewellery may come from our: floral, 60's wallpaper, black and white photography, birds, sea life or postage stamp collections! Guess who couldn't escape the old-fashioned flair of ephemera? Commonly used for scrapbooking, it obviously makes for stylish pieces to wear too. Before anyone starts wondering why there are six and not three pieces shown - two grab bags, one box (the theory being that each of the lucky dips consists of one necklace and two brooches). As much as I'm happy with the designs I did receive, it is a bit of a shame that no piece with 60s wallpaper has been included, because those patterns rock. Still, a lovely variety of delightfully nostalgic accessories! Do vintage designs and retro patterns make your heart beat faster too? 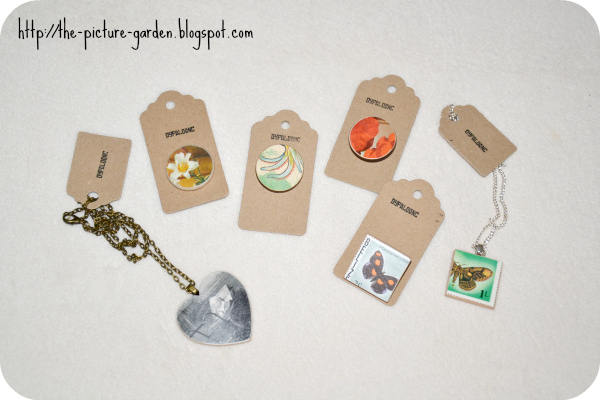 Have you ever seen ephemera being used to create jewelry? And would you agree that the brooches make for cute lapel pins? Hey there little sailor girls and boys! 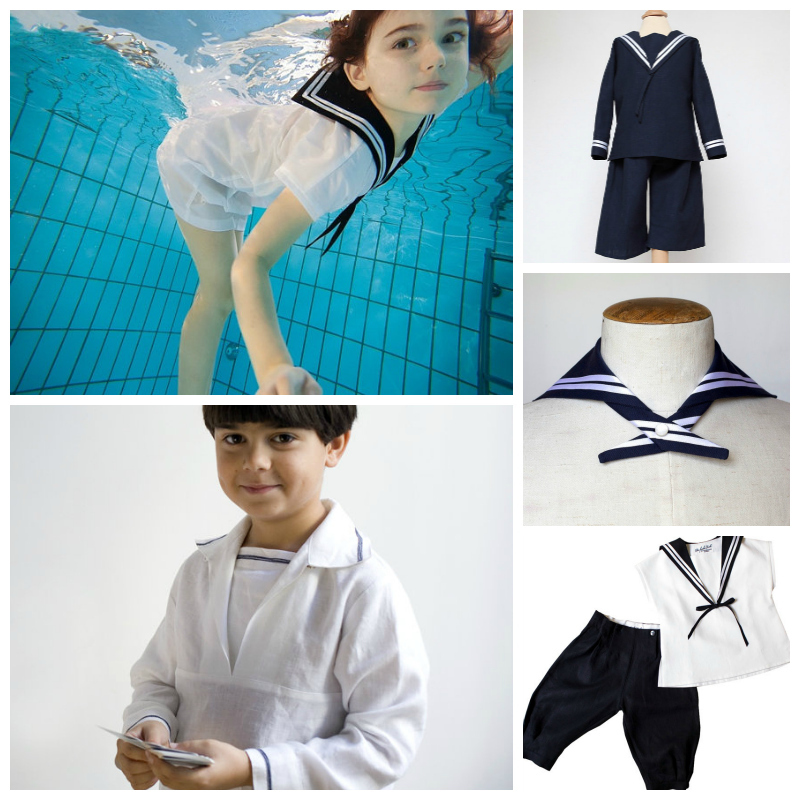 Der Fesche Ferdl lets your kids set sail in the most darling little sailor suits. Creating costumes for drama, film, dance and opera productions was soon followed by dressing the little ones in these vintage inspired suits and dresses sewn from the finest linen. Ship ahoy, wee sailors! Traditionally old-fashioned family photos? Guess again. delusions.at centers around manipulation, destruction and recreation bringing a different kind of art onto your walls. 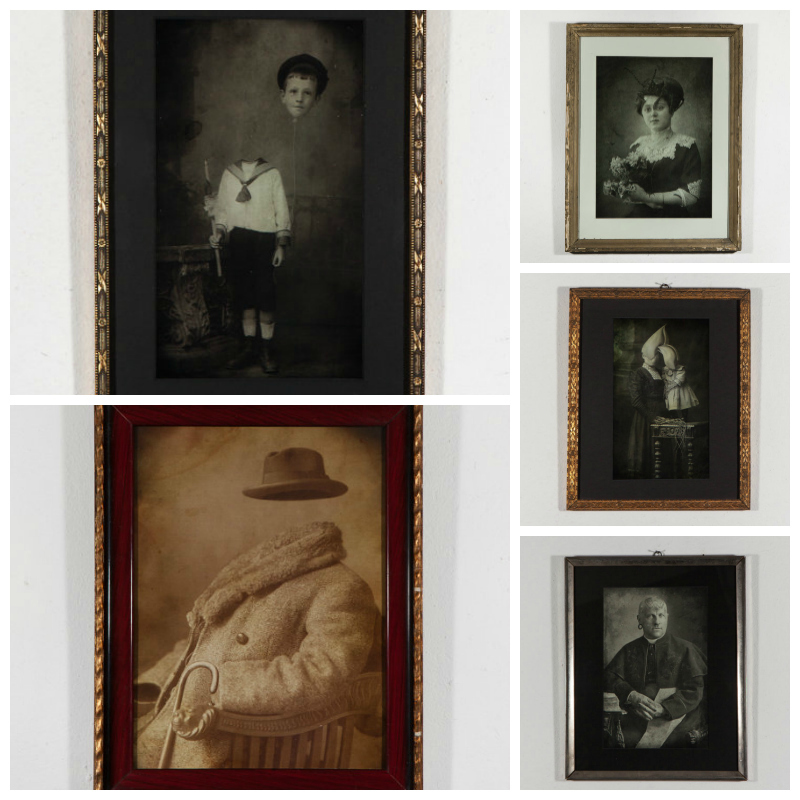 These art prints show a curious and unearthly spectrum of photo-montages, perfectly shown off in vintage frames which add just that extra touch of "good old days"! Welcome to the October edition of crafty books galore! Do any of these books inspire you to get crafty? Any October publications on your wishlist which you'd like to share with me? And last but not least - happy crafty reading, y'all! 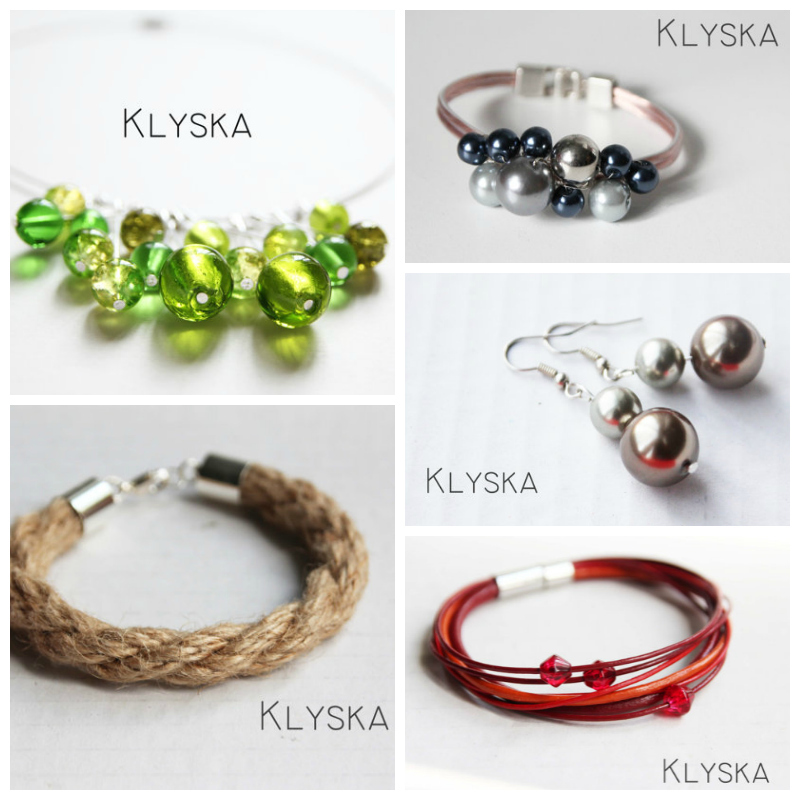 Klyska brings chic elegance into your jewelry box! Inspired by the living in Vienna, combined with a passion for design and the love for learning new techniques and experimenting with different materials, these pieces receive their fashionable charm! Time again to share some bookishly crafty goodness with you. You see I'm not just fond of my camera but also of book-shaped objects. In case you didn't know yet, I'm also book blogging over at The Book Garden and am now sharing my love for reading and crafting by giving away books of the crafty kind. 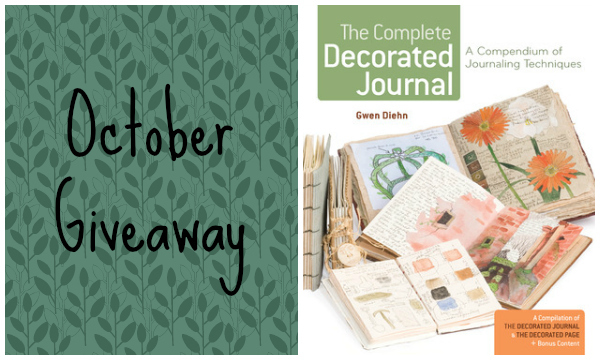 In this month's giveaway you can get your hands on The Complete Decorated Journal: A Compendium of Journaling Techniques by Gwen Diehn! Congrats to Maegan M. from Canada!